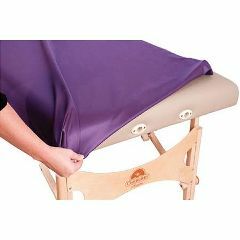 Give extra protection to your massage table and make your table look new with Oakworks Fitted Massage Table bed protector. Crafted from earth-friendly TerraTouch fabric. The Fitted Table bed Protector has a tight & secure fit that is available in 2 sizes and will fit portable tables up to 31" wide and 73"L.
Waterproof, stain-resistant, hygienic surface supports damp spa treatments such as mud and seaweed wraps, while protecting table top from exposure to lotion, oil and creame. Easy-care fabric is incredibly durable and eliminates the need to inventory disposable drapes.